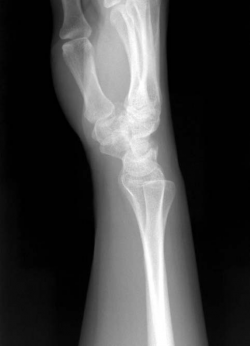 Figure 1: lateral X-ray shows dorsal subluxation of the ulna. Video 1: Distal radioulnar joint subluxation. The DRUJ is a synovial pivot joint. A synovial pivot joint is a type of a synovial joint. A synovial joint achieves movement at the point of contact of the articulating bones. A synovial pivot joint consists of one bone that rotates about the other. It is stabilized by intrinsic and extrinsic mechanisms. - the ulnar collateral ligament. The cause for dorsal subluxation is extreme pronation and extension, with a strengthened extensor carpi ulnaris and ulnar carpal ligaments, which pull the ulnar head out through the dorsal capsule. Triangular fibrocartilage complex avulsion and weaking of the palmar radioulnar ligament will allow this dislocation. - both bones of the forearm. By isolated injuries, ulna dorsal dislocations occur as a result of hyperpronation, while ulna palmar dislocations occur as a result to hypersupination. There are simple and complex types of distal radioulnar joint dislocation. Simple dislocations are reduced spontaneously or by closed means and minimal effort. Complex dislocations include irreducible or easily subluxatable or dislocatible cases. Chronic instability of the distal radioulnar joint can also occur as an isolated injury or may be associated with the distal radius malunion. Chronic instability of the distal radioulnar joint is first dynamic, then it becomes static as it progresses to osteoarthritis of the joint. The stability of the joint is the function of both the intact restricting ligaments and the congruity of the radioulnar joint. If distal radioulnar joint subluxation or dislocation is an isolated injury, the only visible cause that appears is swelling. All wrist motions are often painful. Chronic instability with none malunion can be treated with soft-tissue reconstruction. Therefore exists two different reconstruction techniques: extra-articular and intra-articular reconstructive. Extra-articular reconstructions provide stability between the radius and the ulna without opening the distal radioulnar and the ulnocarpal joints. Intra-articular reconstructions restore the normal triangular fibrocartilage ligaments. Another surgery that can be accomplished is open or closed reduction. Closed reduction should be accomplished under regional anesthesia to provide adequate muscle relaxation. Closed reduction for not taking care of subluxations of the distal radioulnar joint should be based on the direction of the dislocation. Open reduction is indicated when closed reduction is not possible or not adequate. Associated fractures should be evaluated on the basis of their individual fracture pattern. Treatment of simple subluxation in the acute setting consists of immobilization in a reduced position: the position of the forearm should be neutral for bidirectional instability, supination for ulna dorsal dislocations, and pronation for ulna volar dislocations, for six weeks in an above-elbow cast. . Postoperative immobilization position and duration are similar to simple dislocations. The fracture braces do not cross the elbow or the wrist joint and therefore allow full motion and function of all joints of the arm, including forearm rotation. Patients state that the custom-fitted brace is more comfortable and of lower profile than the commercial brace. A patient usually will adjust the tension of the brace to maximize comfort and minimize instability. Tension may be reduced to avoid overcorrection of DRUJ translation. Fracture bracing might be able to improve symptoms of chronic posttraumatic or postsurgical DRUJ instability, and may be a viable alternative to medical managment, especially for lower-demand patients. 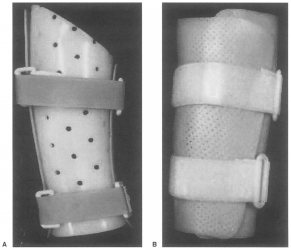 More active patients often choose surgical stabilization rather than choosing to continue with an indefinite period of brace wear. 1. Strength of the forearm flexors was significantly reduced by immobilization, whereas the forearm extensors were unchanged. 2. Movement time of ballistic movements was insignificant. 3. Significant decreases were noted during flexion in the antagonist (triceps brachii) peak IEMG (integrated electromyography) amplitude and large decreases were noted in agonist peak IEMG amplitude and agonist second burst peak IEMG amplitude during flexion, indicating a general reduction in volume of muscular electrical activity. During extension, significant decreases occurred in agonist peak IEMG amplitude and antagonist peak IEMG amplitude. The focus of rehabilitation should be on the prevention of muscle atrophy by blocking the decreases in neuromuscular activity associated with limb immobilization. Although this focus may not eliminate all atrophy attributable to injury and subsequent immobilization, it may provide a significant reduction to allow a substantial savings in disability and rehabilitation time. They observed a decrease in muscle functions after 3-week forearm immobilization. However, the low volume exercise training (about 2 minutes per training) for endurance and strength reduced the magnitude of decreases in muscle functions induced by immobilization. This low volume training may be suitable to clinical application also on old subjects. Low-volume muscular endurance and strength training: First, intermittent isometric hand grip exercise at 70% maximum voluntary contraction for 2 seconds with a 2 second rest interval was repeated 10 times. Next, dynamic handgrip exercise was performed at 30% maximum voluntary contraction at a rate of 1 repetition per 1 second until exhaustion. After immobilization, patients often suffer decreased cardiovascular fitness, muscle strength and range of motion of the immobilized limb. Physical therapy can reduce recovery time, may allow the patient to return to normal activities quickly and safely, may improve function and decrease the risk of future injuries. Cardiovascular or aerobic fitness can be lessened if your immobilized limb leads to a decrease in physical activity. To improve cardiovascular fitness, a physical therapist can design an aerobic program that fits your needs and injury. At around 10 days of immobilization muscle atrophy or loss of muscle strength and size begins to occur. To reduce atrophy, a physical therapist often prescribes isometric exercises. This improves muscle strength and slows the results of muscle atrophy. During 6 to 8 weeks of immobilization, muscle tissue and other connective tissues not only weaken but can also shrink and limit normal motion. The immobilized limb is stiff and difficult to move depending on the length of immobilization. A physical therapist can help you progress faster and more safely through exercise, stretching, and other therapies, he helps you to regain normal use of the extremity and decreases the risk of injury to the weakened tissue. For the active or athletic population, this therapy includes higher level exercises such as plyometric, proprioceptive and sport specific training. ↑ Pürisa H, et al. Ligament reconstruction using the Fulkerson-Watson method to treat chronic isolated distal radioulnar joint instability: short-term results. Acta Orthop Traumatol Turc. 2011;45(3):168-74. ↑ Youtube. Distal Radioulnar Joint Subluxation / Dislocation. http://www.youtube.com/watch?v=MgwMXK_MQ8Y. ↑ World Health Organisation, The WHO manual of diagnostic imaging. Subluxation distal radioulnar joint. http://whqlibdoc.who.int/publications/2002/9241545550_eng.pdf. ↑ 5.0 5.1 Tsai PC and Paksima N. The Distal Radioulnar Joint . Bulletin of the NYU Hospital for Joint Diseases 2009;67(1):90-6. http://www.ncbi.nlm.nih.gov/pubmed/19302063. ↑ 6.0 6.1 6.2 6.3 Wheeless' Textbook of Orthopaedics. http://www.wheelessonline.com/ortho/radial_ulnar_joint_instability. ↑ Lo IK, et al. The radioulnar ratio: a new method of quantifying distal radioulnar joint subluxation. J Hand Surg Am. 2001 Mar;26(2):236-43. http://www.ncbi.nlm.nih.gov/pubmed/11279569. ↑ Wechsler RJ, et al. Computed tomography diagnosis of distal radioulnar subluxation. Skeletal Radiol. 1987;16(1):1-5. http://www.ncbi.nlm.nih.gov/pubmed/3823954. ↑ Watanabe A., et al. Ulnar-sided wrist pain. II. Clinical imaging and treatment. Skeletal Radiol. 2010 September; 39(9): 837–857. http://www.ncbi.nlm.nih.gov/pmc/articles/PMC2904904/?tool=pmcentrez. ↑ Millard GM et al. Functional bracing for distal radioulnar joint instability. J Hand Surg Am. 2002 Nov;27(6):972-7. ↑ Vaughan VG. Effects of Upper Limb Immobilization on Isometric Muscle Strength, Movement Time, and Triphasic Electromyographic Characteristics. Phys Ther. 1989 Feb;69(2):119-29. ↑ Matsumura M. et al. Low-volume muscular endurance and strength training during 3-week forearm immobilization was effective in preventing functional deterioration. Dyn Med. 2008 Jan 15;7:1. ↑ William L., and Mullennax J. A. Physical Therapy for Cast Immobilization. Columbus, Georgia. http://www.hughston.com/hha/a_14_2_3.htm.